This Airstream Safari is ready for adventure after an incredible renovation that maximizes space and packs style into every nook and cranny. A strong theme of beautiful wood tones and shiny metal is strewn throughout the interior, and we love how it mimics the vintage yet futuristic vibe we get when we see them zip by on the road. 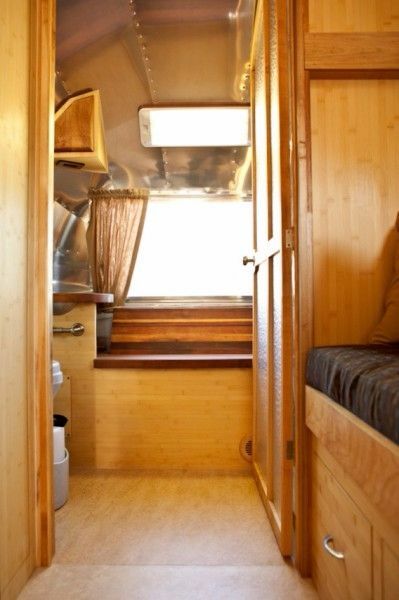 The Airstream may be just 22 feet long, and a few feet wide - but the renovators have made every inch count. From creative drawers to the expandable furniture we love inside these trailers, this Airstream is packed with pleasant surprises. Take the tour and start dreaming of your very own cross country trip in this beauty. 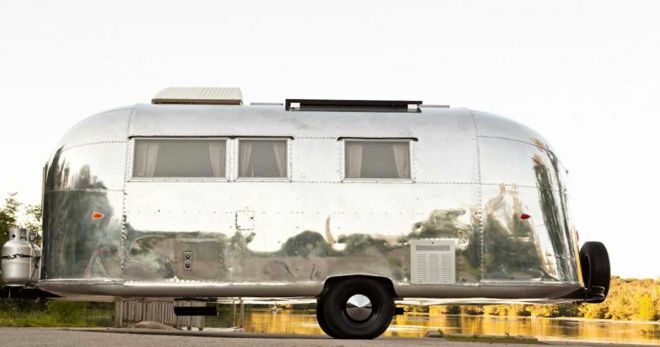 Towed behind your car, or parked next to a world wonder - this Airstream is going to steal some of the shine. The classic curves and stunning mirrored sides make us swoon. Inside you're instantly welcomed by the warm golden wood, and this beautiful little kitchen. This kitchen has all the brand new appliances you'd need like a gas stove and oven - and even a sink with a glass top cover so you can use it as a cutting board in this space with minimal counters. Look at that awesome storage! What was once just a little outlet for a bottom vent is now real utilized space thanks to those tilting drawers. Stuff them with napkins or utensils and you've saved much-needed space elsewhere. The curved ceiling is the same metal we fell in love with outside. This lets all that natural light bounce off its surface and make this space feel bigger. Plus, we love the juxtaposition of the industrial metal with the organic wood. By the way, that's a dishwasher tucked under that countertop! To the right of the dishwasher, and adjacent to the kitchen is the big comfy couch. Up above is extra storage where you can keep your linens - because of course, this pulls out to a nice full-sized bed. To the back of the Airstream is the bath. Totally renovated like the rest of the trailer, this space is just as sleek as the rest with shiny metal accents against that nice smooth wood. 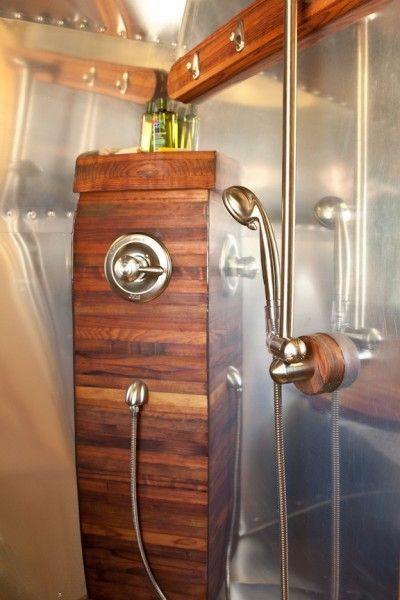 This shower looks so good you might just forget that you're bathing inside an Airstream! And that's the point of these, right? To enjoy them like home, but relish in the tiny quirks. 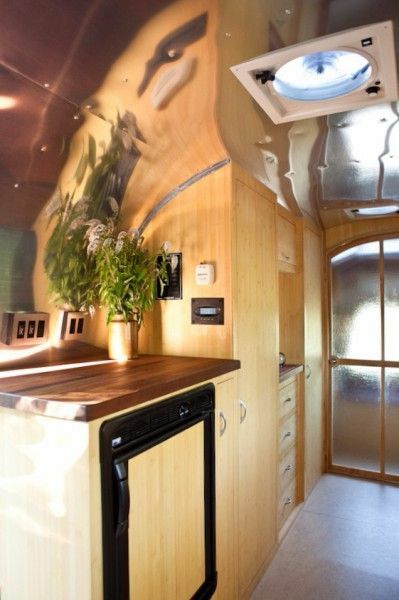 This is such a creative and fun Airstream renovation. SHARE it with those you know would appreciate it! Welcome to Mountain Storm: A sleek and polished Airstream International. 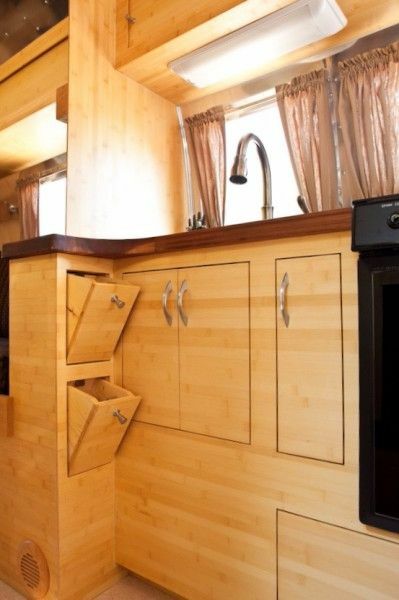 When a woodworking couple decides to renovate an Airstream, you can be there will be some impressive handiwork. 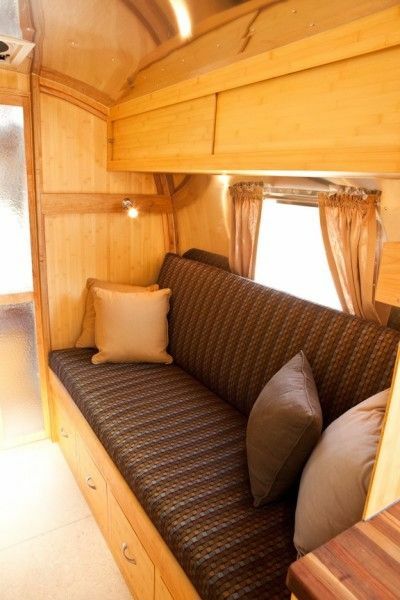 Custom seating and sleeping areas transform this finished Landyacht into a comfortable guest house. 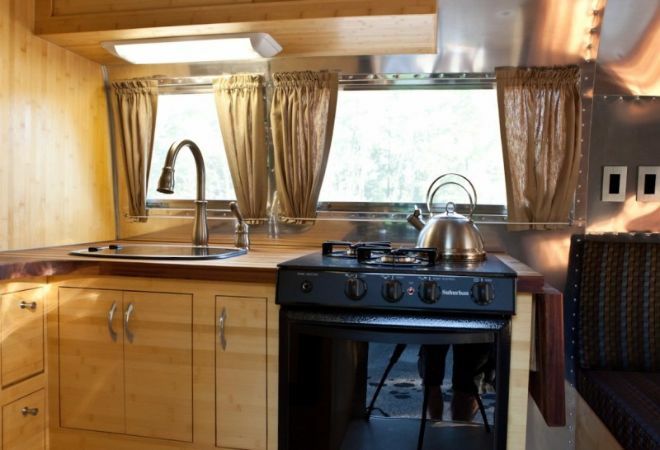 This Safari Airstream has been updated with a homey interior and killer views.